What do you need to focus on to transform your company from good to great? This is the fundamental question that underpins today’s book. This is episode #49 of the Ideas Architect podcast. And, it’s a Book Rapper recording derived from an important business book. 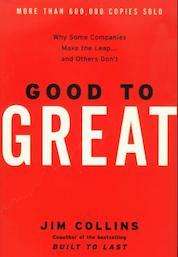 Today we share the Book Rapper Good to Great summary derived from Jim Collins’ best selling book. A Climate of Truth – The power of confronting the facts as a means to making a series of good decisions. Why you need outward discipline rather than inward discipline as your guiding force. Why a forward moving Flywheel is much better than the backward moving Doom Loop. How to manage the yin and yang of preserving the core elements whilst stimulate growth.